Horses were the main thing to Chuck Hayward, born Charles Bert Hayward January 20, 1920, on a ranch five miles northwest of Hyannis, NE, where his parents, Bert and Hazel raised some of the finest horses in the Sandhills of western Nebraska, which were then sold to the U. S. Cavalry at Fort Robinson. Chuck grew up with a love and respect for horses; and he broke a lot of the colts sold to the Cavalry. He left home at the tender age of sixteen and found work breaking more horses and toiling in the hayfields. Chuck’s grandparents sent him to Curtis Agricultural School, where he graduated in 1938. He attended business college in Omaha, then enlisted in the Merchant Marines and spent his duty during the war on board ship. Afterward, Chuck returned to the west and did some rodeoing in Nebraska, Wyoming and South Dakota. Finally, in 1947 Chuck decided to try his luck in California, arriving in Van Nuys, with his old, beat-up pick-up truck and 14 dollars to his name. The first couple of years were lean ones, but he managed to pick up odd jobs cleaning horse barns and stacking hay. His work always seemed to find him around people with horses and through folks at various barns around Hollywood, Chuck finally got a foot into the film business, which he really liked, and settled on it for his career. 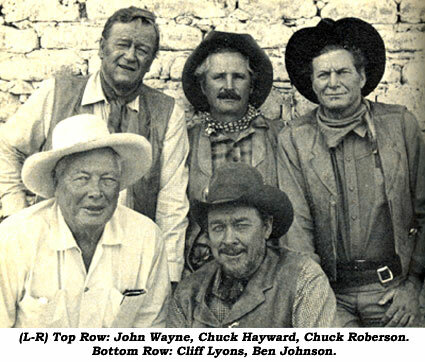 In 1949 Chuck was hired for “Fighting Kentuckian” at Republic, starring John Wayne, who would become a lifelong friend. He went on to do 24 of Duke’s films. In a career that spanned almost 50 years, Chuck Hayward became one of Hollywood’s most admired and respected stuntmen and stunt co-ordinators. 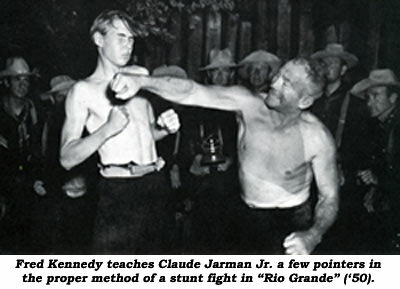 He was a favorite stuntman on many of the films by such directors as Henry Hathaway, John Ford (who christened him “Good” Chuck) and Howard Hawks. He doubled such stars as Yul Brynner, Chill Wills, Richard Widmark, John Wayne, Steve McQueen, Clint Eastwood and Burt Reynolds. 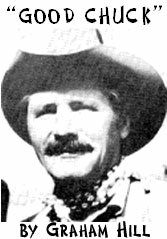 Chuck Hayward and his famous falling horse, Twinkle Toes, appeared in hundreds of films and TV shows including “True Grit”, “The Searchers”, “Rooster Cogburn”, “Gunsmoke”, “Rawhide”, “Tom Horn”, “Zane Grey Theatre” and Sam Peckinpah’s first, “Deadly Companions”. His work in films took him all over the world…Spain, Yugoslavia, Mexico, Italy, Afghanistan and Argentina (for “Taras Bulba”). Chuck Hayward was a good friend and always encouraged me in the stunt profession. He backed my membership into the Stuntmen’s Association to which we both belonged, and to which he was voted a lifetime member. Sadly, after all those years and hundreds of stunts Chuck’s health was not good his last few years and he passed away of Hodgkin’s disease February 23, 1998. We can still marvel at Chuck’s stunt expertise and see the many speaking parts he did as we watch the films he appeared in over the years. Stuntmen from Chuck Hayward’s era were a special breed. He was one of the best at this craft. Chuck Hayward is a stunt performer whose specialty was working with horses. From riding and falling, if Chuck was ever second to anyone, it would only be someone of the stature of Yakima Canutt. 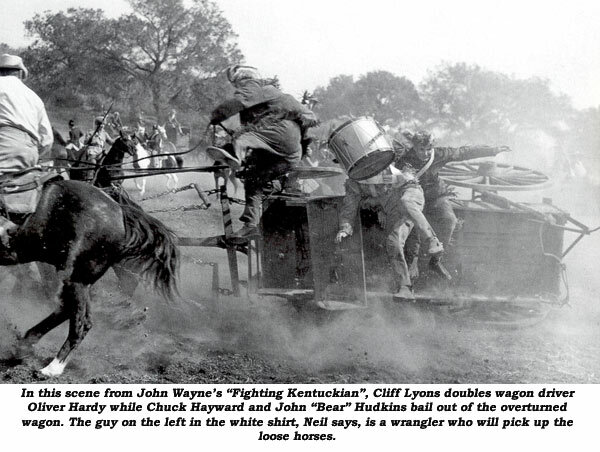 But it was another stunt pioneer, Cliff Lyons, that would be the inspiration and mentor for a new generation of stuntmen fresh out of service after World War II. 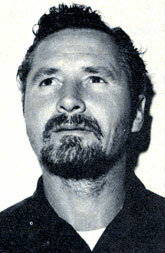 Chuck Hayward, along with the likes of Chuck Roberson, Jack Williams, Bob Morgan and Terry Wilson, made up a stunt team that was like a fraternity. When they weren’t taking their bows in some John Ford picture, they were just as scholarly in some Arabian Nights fantasy or other period history assignment. In the beginning, 1947, because of average height and build, Hayward was known in the business as “Little Chuck”, a marked contrast to his close friend Chuck Roberson, a tall, burly man who spent most of his stunt career doubling for John Wayne. They were on location shooting the classic “Rio Grande” when director John Ford gave them the nicknames they’d be labeled with for the rest of their working lives. Ford decided Roberson, because of his way with the ladies, would get the title “Bad Chuck” and Hayward that of “Good Chuck”. Not to say he was “Good” all the time. After all, stuntmen have that certain rough, tough stereotypical reputation to maintain. 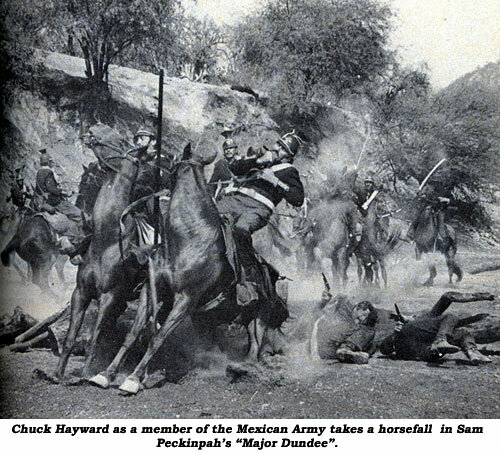 I was about to meet a retired Chuck Hayward, a man in his 70s…a man who had taken more than his fair share of knocks and spills and, somehow, still managed to escape major injury, even when executing in “The Alamo” one of the most spectacular falls from a galloping horse ever filmed. Or surviving being set on fire doubling Yul Brynner in “Westworld”. Even tho now an invalid, Chuck graciously found time to talk to me despite his pain. I didn’t have the heart to ask him what had reduced him to this condition, where he had to be looked after constantly by a live-in male nurse. Even though he was frail in his bed clothes and connected to life giving tubes, you knew you were in the presence of someone special. His modest Sun Valley, CA, ranch-style home was aptly located close to Hollywood. On the mantle in the living room was something that really caught my eye, a full collection of the decorated coffee mugs John Wayne bestowed on selective cast and crew members each time they worked together. Chuck’s first Wayne picture was “Fighting Kentuckian”. There were the mugs, priceless souvenirs from “Rio Bravo”, “War Wagon”, “Horse Soldiers”, “Searchers”, “El Dorado”, you name it. More than a dozen titles Chuck could easily sell for a fortune. Altogether, Chuck worked in 24 Wayne films. On the walls were various production stills featuring Chuck in action and candid shots posed with co-workers. Even though it was difficult for him to speak, he told me of his friendship for “Duke” and “Pappy Ford”. Chuck, you’ll recall, was the one, who, as a Union officer, gets knocked off of his horse in a saloon when disturbing Wayne’s drowning his sorrows in “The Horse Soldiers”. In “True Grit” he’s the man who operates the ferry for Wayne and Glen Campbell. He was the stagecoach driver who brings governor Mel Brooks into town in “Blazing Saddles”. He’s “Hondo” breaking a bronc. But for me, besides being a Mexican getting shot off his horse by Laurence Harvey in “The Alamo”, Chuck was at his best as one of the Hennesey boys in “The Big Country”…the one who “roman rides” the buckboard team Carroll Baker and Gregory Peck were trying to escape in. On the subject of horses, Chuck could be quite vocal on his love/hate relationship with them. 1,500 pound beasts with minds of their own, trained or otherwise. Chuck often trained his own horses (Twinkletoes and Iodine) to fall, to minimize the risk involved. He related the story of how veteran stuntman Fred Kennedy simply fell off his horse and died during the making of “Horse Soldiers”. Chuck said because of John Ford’s close friendship with Kennedy, the “Old Man” was never the same after that. I could have persuaded Chuck to continue on with other stories, but clearly I could see it was starting to tire him. There’s that old famous line that’s credited to John Ford in “The Man Who Shot Liberty Valance”, “This is the West, sir. When the legend becomes fact, print the legend.” So it is true of how we remember legends. I’ll always remember Chuck Hayward as an agile, full of life, stuntman’s stuntman. A man who really knew his way around a horse! Walter Reed, who portrayed a Union officer in “Horse Soldiers”, told WC he disagrees slightly with Hayward’s assessment and vehemently with Burt Kennedy’s account (in his book HOLLYWOOD TRAIL BOSS) that Fred Kennedy died in Ford’s arms. Ford liked 48 year old Kennedy and used him whenever he could, altho Kennedy was out of condition. On this particular day, Ford had pre-arranged a practical joke on Kennedy involving leading lady Constance Towers. Kennedy was doubling William Holden near Natchitoches, LA.